And yet another month has flown by. It is actually a bit sad to think that we have just another one to go before wrapping up this season, and start taking the camps down again. But we’re not there yet, so let’s talk about what happened in September! If you read our last newsletter you remember that it had rained in early August. No worries, this has not happened again, but the weather brutally changed from winter to summer, and we have had some real heat already! I’m writing you this newsletter from California, where I am ending a marketing trip that started on September 3rd! 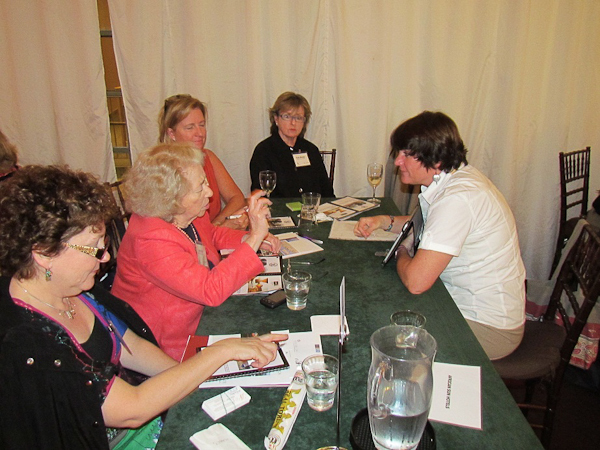 I participated in the 4th Southern Africa Showcase roadshow sponsored by South African Airways. 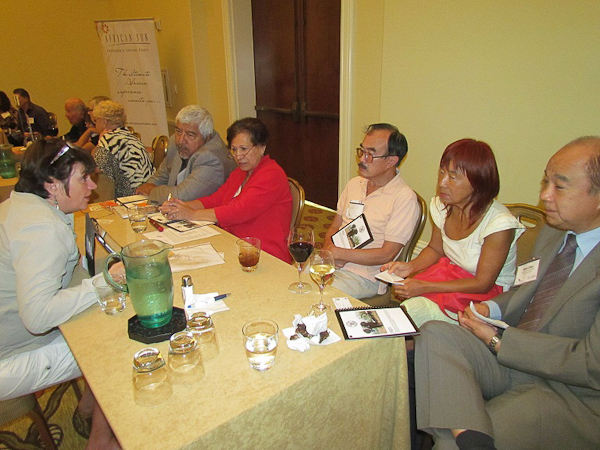 The cities covered by the roadshow were Los Angeles (Orange County), Denver, Atlanta, Boston and Greenwich, to which we added Fort Lauderdale, Dallas and Sacramento. 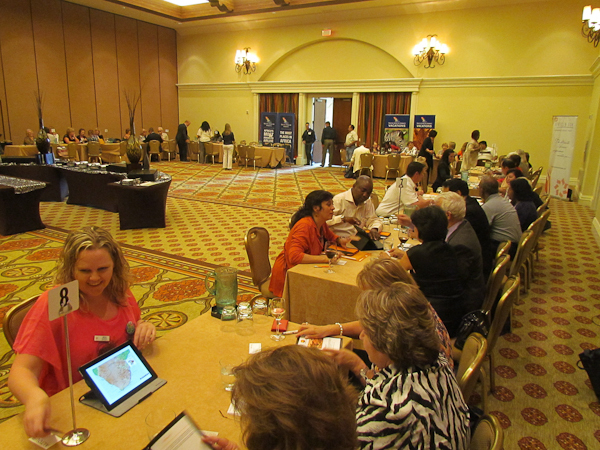 It’s been a very productive trip for our marketing, reaching out to over 420 travel partners! I am missing camp though, and for good reasons! 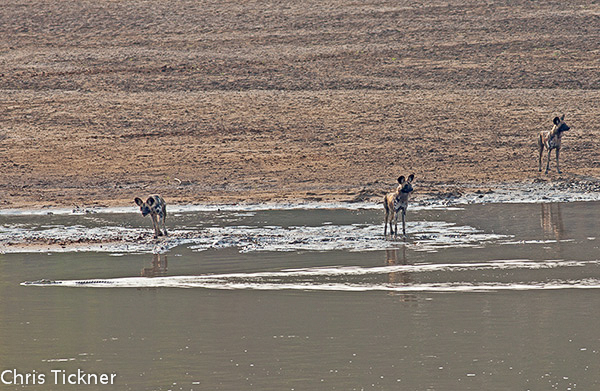 The sightings have continued to be amazing, especially that particular day of early September when a pack of WILD DOGS decided to take a swim just across from Kaingo Camp, on the Nsefu sector. 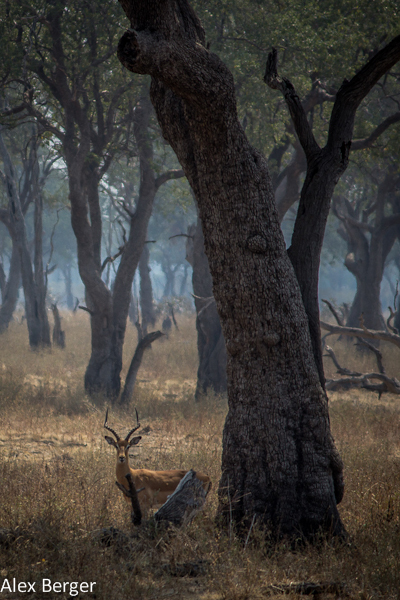 “Camouflage is a large part of many animals defence system in the bush. Lions can conceal them selves in the grass with their tawny coats, kudu have disruptive markings to break up their body shape and help to blend into their thick, busy habitat, and leopards are covered in a pattern of rosettes that make them look like part of a tree trunk or dappled earth. Other animals, like zebra, have stripes that allow them to blend into the background, especially at a distance. 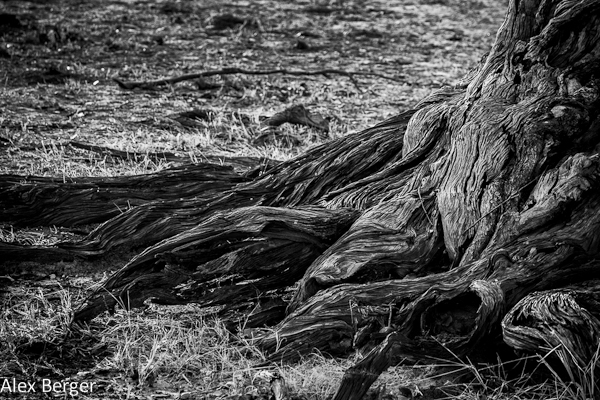 Dude to these remarkable systems, many times a log, a stump, or even another animal at a distance can resemble an elusive cat or other predator. Yesterday morning my guest and I went to investigate an area where several of the Mwamba Pride had killed a baby buffalo the night before. As we approached the spot near the Ebony Grove, I could see three figures on the opposite Nsefu Sector bank. My mind immediately said DOG! 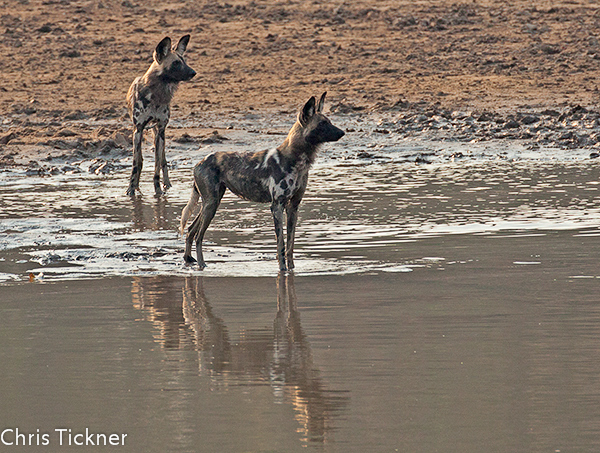 But as there are rarely any sightings of jackal and our pack of Wild Dogs has not been seen this season, as well as the fact that Wild Dog are rare in the park as well, I thought to myself that my mind was playing tricks with me and they must be a well placed animal of another sort. 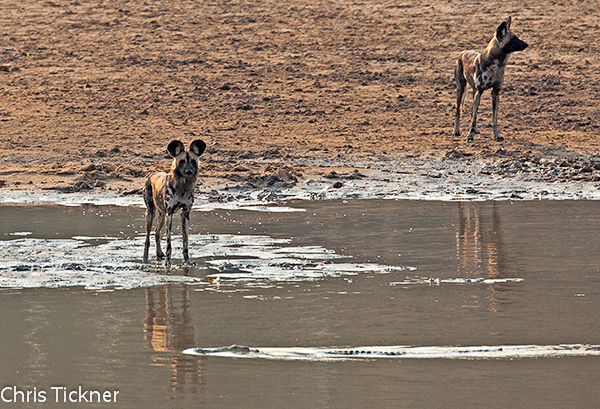 Still, I lifted my binos to get a better look, just on the off chance that the shapes across the bank may well in fact be the ever elusive Wild Dog, and low-and-behold they were! Three of them, no more than sixty meters from our bank, and they were in perfect view. I excitedly explained to my guest where they were situated. We were both grinning from ear to ear as we decided to reposition the vehicle to get a better view. Thank you to return guest Chris Tickner for sharing his pictures. That was a great start to September! Once I’ll be back in camp, I’ll be able to gather more pictures from the great sightings they have had. “We are sitting in Mwamba hide, a couple of meters from the camp, hiding and observing nature and the animals that don’t notice us; undisturbed, continuing their daily life. Below the hide’s look-out, there is a small pool of water where birds drink and take a bath. Once clean, they rest on the branches to dry themselves. At about 10.35, I suddenly see something running furtively down the steep river bank. At first sight it seems to me a lioness. I call Brent to attention, and point out the animal which he identifies immediately as a leopard. In the meantime, Elaine hears strong sounds of an animal in agony. 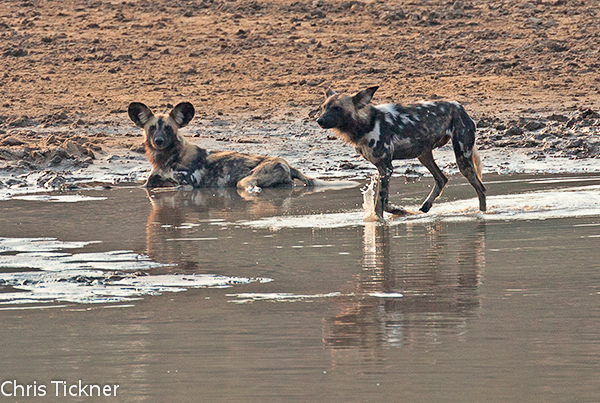 Excited and trembling, we leave the hide almost running, head to the car, and drive in the direction of the action. 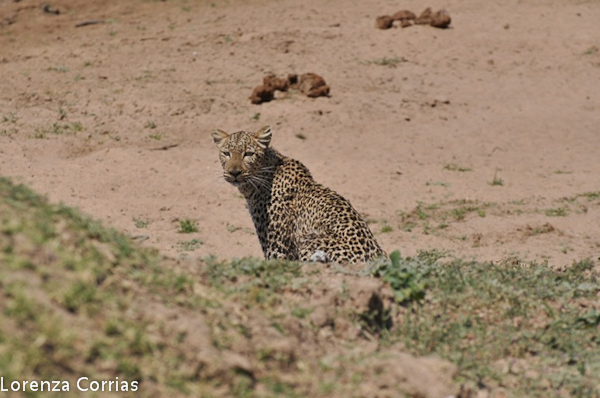 Just as we arrive, we find the leopard bent over an impala carcass, but she runs away and hides behind some trunks of a dead tree next to to a water hole. Through the binoculars we observe the leopard, a female, is completely wet. 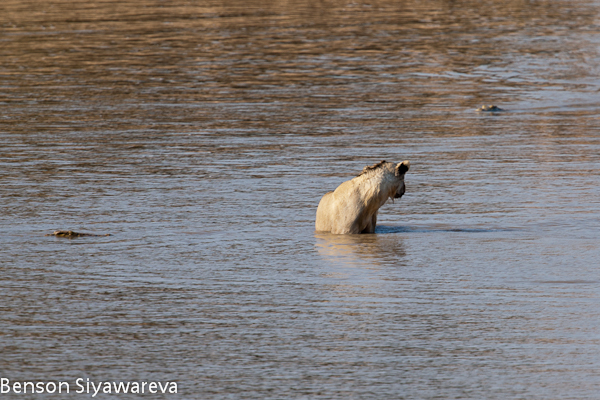 We infer that the impala was killed as it was drinking, dragged down into the water, and drowned. It is now 11 o’clock, and the leopard, after what seems an endless time under the burning sun, moves and comes close to the water to drink. She starts to drink very carefully and circumspect, always keeping an eye on us. After few minutes she stands and slowly walks close to the prey, not detaching her eyes off us. 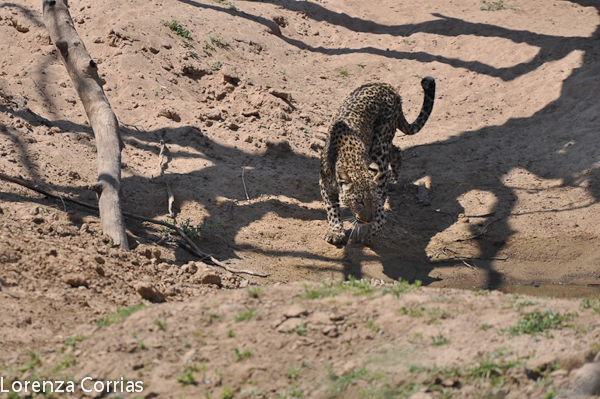 It’s 11.02 and the leopard, in less than a fraction of second, launches into a furious charge against us to ensure we’re not a threat for her prey! These are unique and unforgettable moments. I’m looking at her through the lens yet I’m paralyzed and unable to take a photo. We’re all nervous and afraid, but when the leopard realizes that nothing is moving, she stops sharply, sniffing the air in our direction. Brent assures Elaine that the leopard will smell the vehicle and its fuel and know we are not a threat. Viewing us with suspect and circumspect, she slowly returns to the impala and begins the task of dragging it toward a secure place where she can dine. The impala is heavy and the leopard slim and slender, but with extraordinary strength. 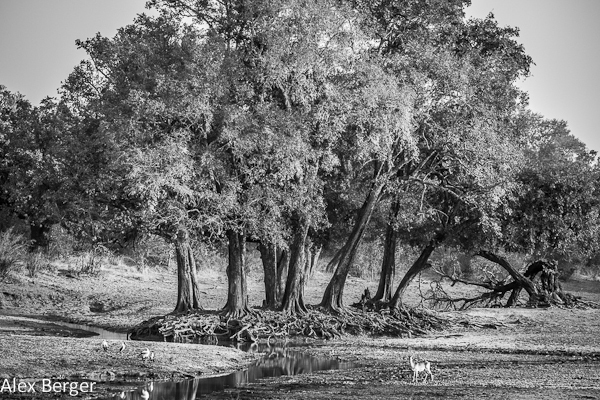 Slowly, stopping every few seconds to retrieve the force, the cat drags the prey along the dry riverbed until she finds an adequate place to pull up the impala to take it on the other side of the river bank. 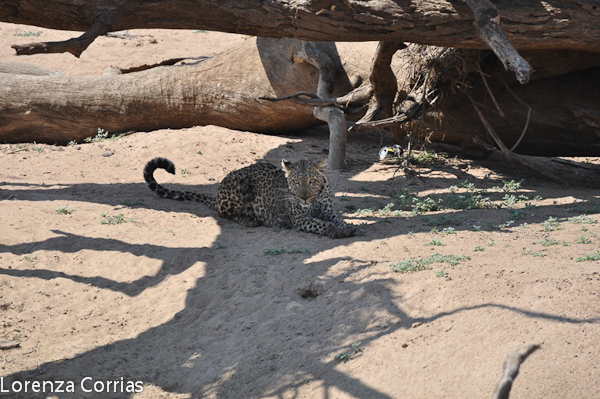 It’s a difficult rise, a steep slope, and the leopard stops many times to rest and catch her breath. Unfortunately, the carcass slips into a crevice between a tree’s roots and she can’t lift it out. 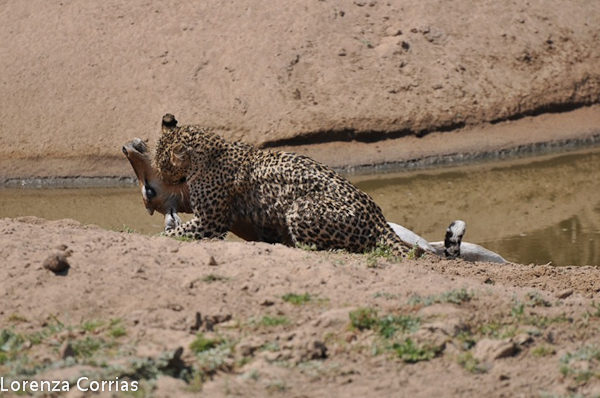 The leopard stops and begins to pinch the impala skin, almost as if to test its elasticity. Brent explains that it’s unusual behaviour because normally, these cats start to eat the rump of the kill first. After few minutes, as predicted, the leopard begins to rip the flesh of the rump, trying to cut the tale and to do a breach and proceed to eat. 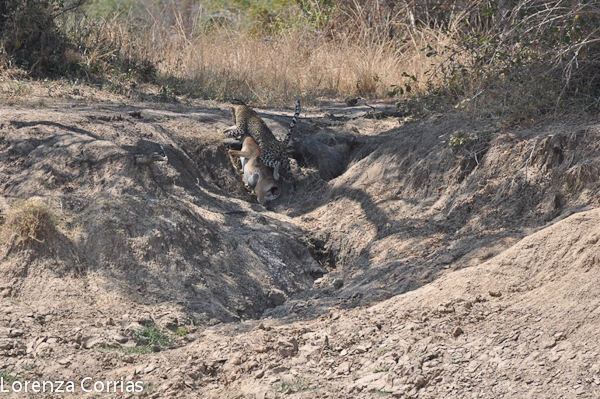 However, after creating a hole big enough, the cat begins to pull out the bowels of the impala through the opening, spreading them on the ground. 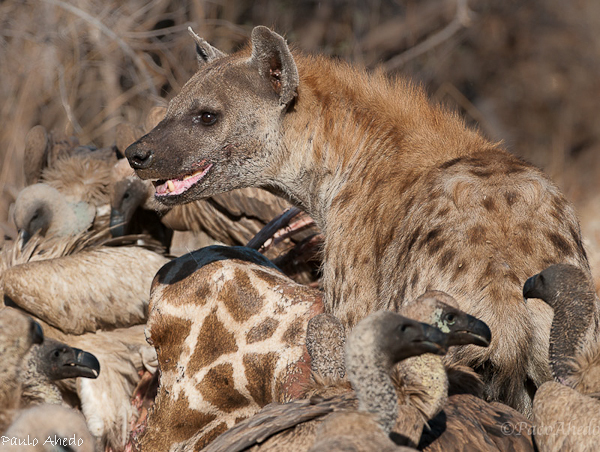 Probably feeling it’s unsafe to consume the food in the open, lest some hyenas surprise her, emptying the animal of its bowels makes it lighter to carry, and so she continues to drag the carcass up the shore until, after a lot of effort, she succeeds in pulling it up and stashes it in the thicket. We can’t believe we are witnessing something so raw and natural. And to grasp the power of this fairly small cat in her determination to hide her kill instills awe and respect in us all. 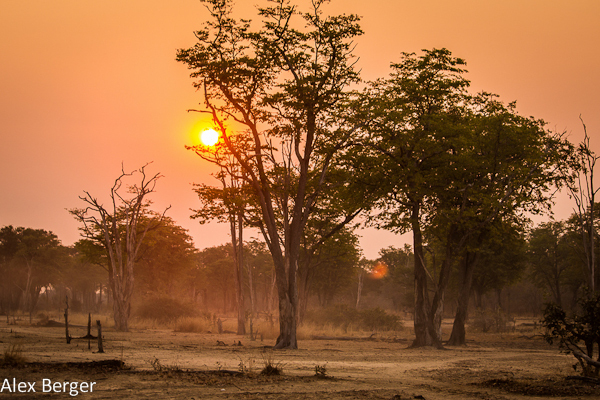 Later, we return to the area and pick our way across the riverbed in the vehicle to find the carcass hidden in a bush, partially eaten, but the leopard is nowhere to be seen. The next day we discover she had gone to retrieve her cub, and revered the hard work she did, how she never gave up so she could feed her cub. We are humbled by this beautiful yet dangerous creature and the real cycle of nature in its natural environment. Another interesting sighting that we had in mid-August was witnessed by our guide Sylvester and his guests Barbara and Benson. 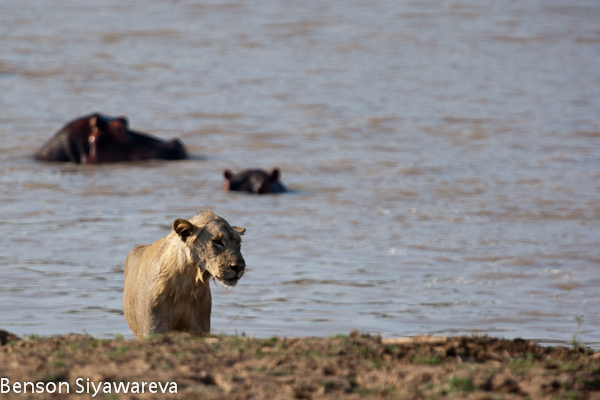 On their morning game drive, they heard some lions calling, and found 2 young male lions on the other side of the river. 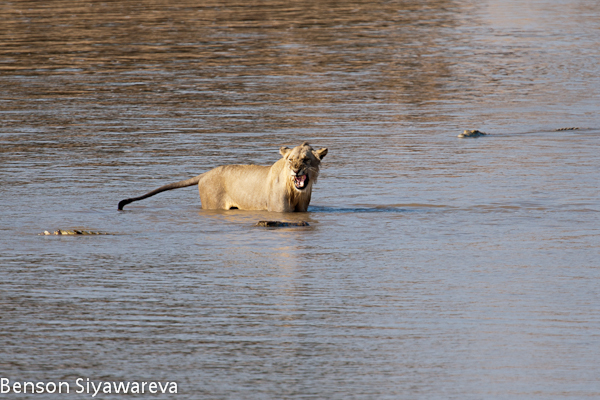 As the lions were contemplating crossing the river, Sylvester decided to hang around for a while. 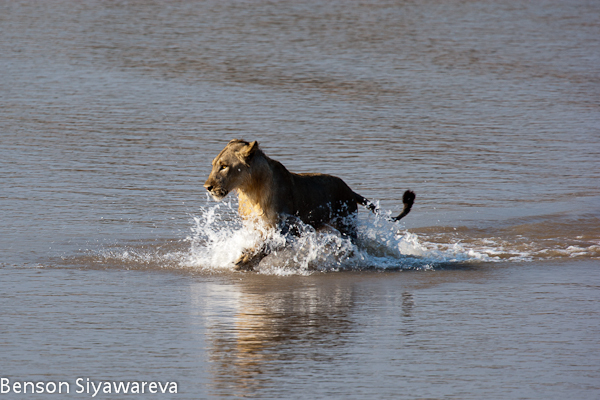 One decided to take a chance, and started walking in the water, soon to be surrounded by crocs! He started snarling and growling, then looked back at his partner, who had safely remained on the bank. It was too late to turn around or move forward, he was trapped! 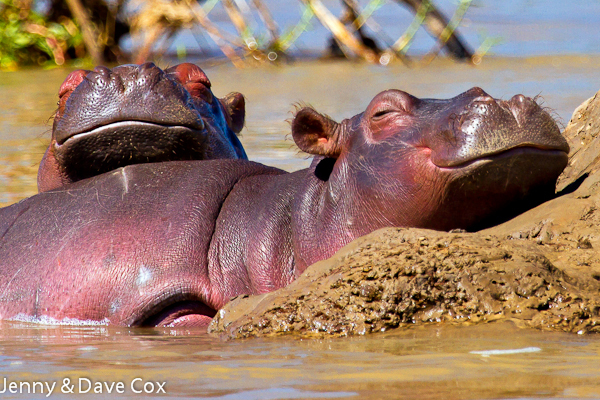 It became quite tense really, and at one point a pod of hippos rushed from the bank, back into the water creating a welcome diversion. 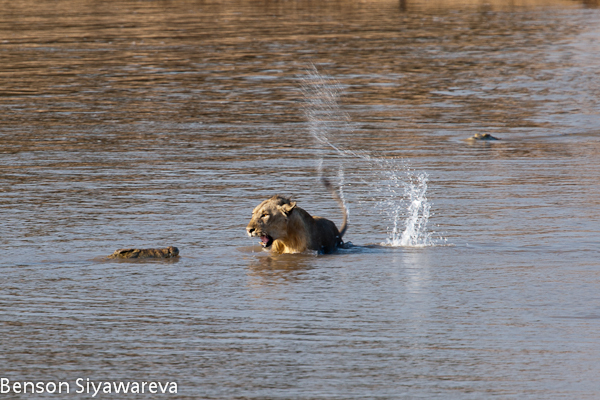 The lion took his chance and ran as fast as he could, splashing through the water, and reached this side of the river safely. It was a close call, something he probably won’t do for a while! The other lion was not so brave, or rather so silly! Later on on their drive, Sly and his guests did see both lions re-united so the other lion must have found a safe place to cross after all. It made for fantastic photo opportunities, as you can see from Benson’s pictures. Benson Siyawareva is an accompanying guide, and director of Ngoko Safaris. You might also remember from previous newsletter that we received the visit of Alex Berger, Travel Blogger http://virtualwayfarer.com, and his family back in July. We’ve already shared some of Alex’s pictures, but I was able to see a lot more of them. 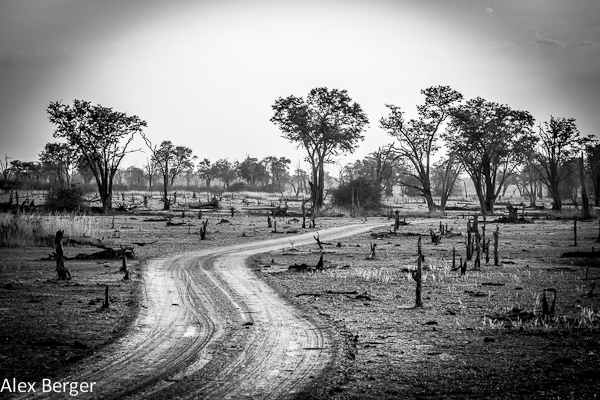 Being away from camp at the moment, I got really melancholic when I saw the landscape pictures of South Luangwa, and I wanted to share some of those with you. They depict so well the atmosphere of this beautiful land. Finally, I wanted to make sure you had a look at our new virtual videos, taken by Johan Vermeulen. We have posted them on our website, and you can find the links in the full newsletter. Johan is in camp at the moment, to capture more videos, especially from the Carmine Bee-Eater Hide. The hide has been in full swing since end of August. Click on the words below to see the videos of Kaingo, Mwamba and some of our activities. On a travel note, the new Aviation Infrastructure and Development Tax which was announced for September had been postponed. But it will now come in effect on October 1st, 2012 and all departing passengers will have to pay this tax whether flying domestic or international. The tax is ZMK 26 400 for domestic flights and ZMK 52 800 for international flights (not included in ticket). The airports authorities are anticipating longer delays as this is applicable to all departing passengers. 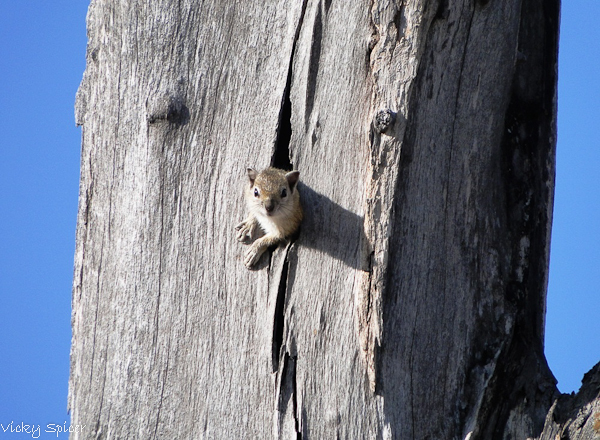 We are ending this newsletter with the winning photographs of our Picture of the Month competition. The theme for September 2012 was “Miscellaneous”. Congratulations to Francisco, David & Jenny, and Vikki! 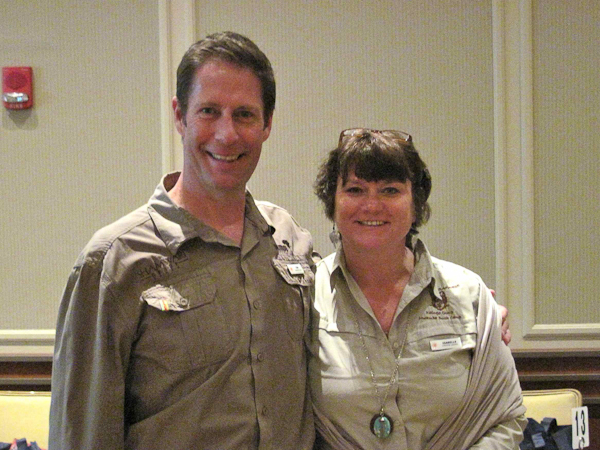 As a matter of fact, Vikki & Darren are currently in camp for another visit, and David & Jenny will be coming back later in October! Welcome back to all of you! Our next selections will be on the following themes: “Ellies” for October; “Monkey Business” for November and “Reptiles” for December. So make sure to sort through your photographs and to email them to us at info@kaingo.com. 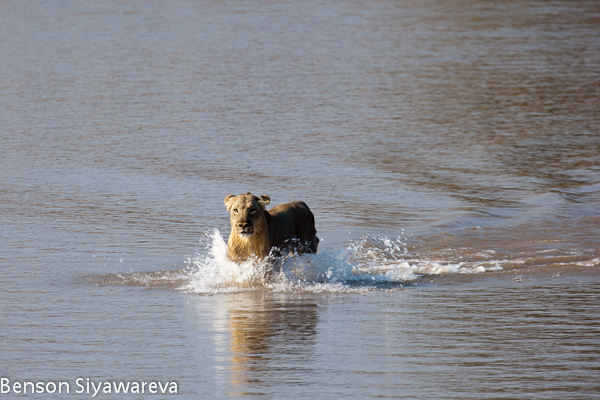 By the time you read this newsletter I will be starting the long journey back to South Luangwa. I can’t wait!! So we’ll catch up again end of October. Settings. Canon EOS 7D, 1/2500sec at f/5.6. Focal 400mm. ISO 200. Settings: Sony DSC-HX1, 1/500sec at f/5.2. Focal 100 mm. Iso 125.